The Harlequin bug is an insect pest in the southern United States with a range that spans from the Atlantic Ocean to the Pacific Ocean. They have more recently moved up the east coast and into New England. 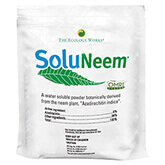 It is an economically important pest in cruciferous plants including cabbage, Brussels sprouts, radish, cauliflower, turnips and the like. 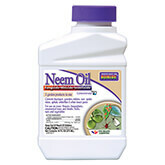 They also like plants in the mustard family – both those cultivated and weedy. If they cannot find cruciferous vegetables or mustards, they will eat tomatoes, potatoes, eggplant, beets, asparagus, beans and a variety of tree fruits. Every life stage of this insect is showy and distinct. Adult Harlequin Bugs are black with shield-shape that is brightly colored with orange, red, and yellow markings and is ¼ to 1/3" in length. Eggs are barrel-shaped and are light gray or pale yellow with two distinct black bands encircling them. Eggs are laid in clusters on crucifer foliage. The nymph is oval and similar to the adult in bright coloration, but is slightly smaller and lacks wings. 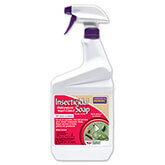 Cultural controls are very important in avoiding problems with this pest. 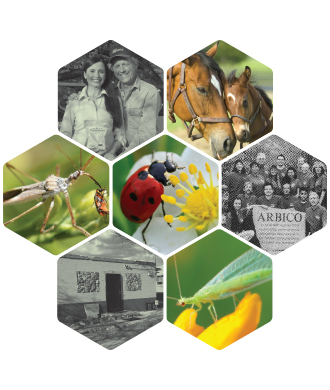 Hand-picking them off plants and keeping a clean and weed-free garden are the 2 most important steps in cultural controls for the Harlequin Bug. 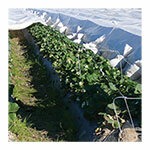 Use row covers to exclude them from your cruciferous and mustard plants. 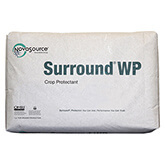 Surround WP is a wettable powder of kaolin clay that is safe to spray on food crops and keeps the bugs from feeding on you plants. 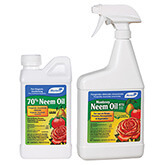 Spray with insecticidal soaps and Neem Oil to kill all stages of this pest on contact. 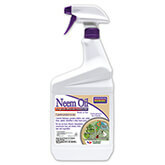 For control products and more information please see our True Bugs page.